0394 - Black Hole Sun - Heroes Inc.Heroes Inc.
Also, that’s a reference to the first “Back to the Future” in the last panel. Kudos. Hey, Family Guy reference in the third panel! I think this would look way better on a flash animation, but its still good. Anyone else think it’s odd that Mario just stole someone else’s song? That song will never belong to it’s rightful owner now. It will. 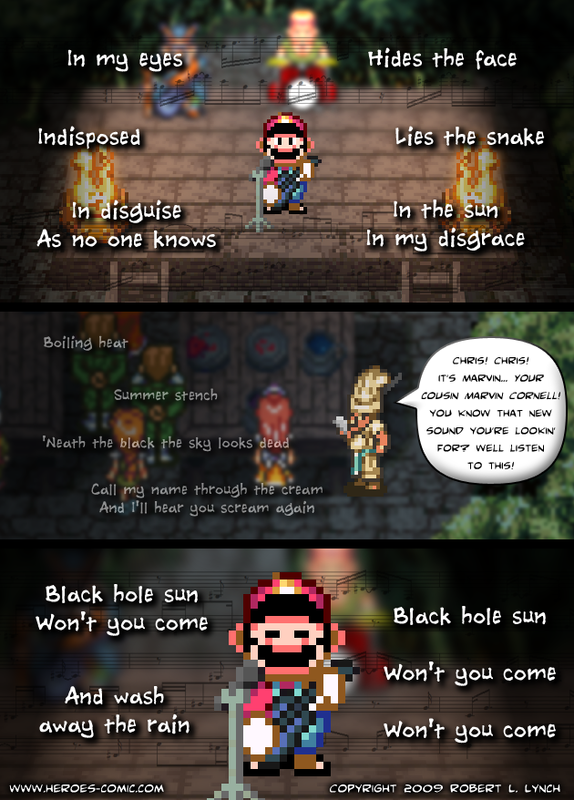 The joke is that Chris Cornell got the idea of his song from Mario. So basically, he stole it from Mario who stole it from Chris. The cool thing about it is that now the song never had a writer. It was just there. And probably 10 other hallucinogens. That video will haunt me forever. Creepy fucker. Total dejavu of Back tho the Future 1.